With a sharp line drawing and a strong V8, Lexus has positioned its new sports car RC-F on the level of the Audi RS 5, BMW M4, and Mercedes C63 AMG. Our brand new KW Variant 3 coilover kit with its individual adjustable compression and rebound damping adjustment gives the 477 hp strong Lexus RC-F an optimal road holding at the driving dynamics limit. 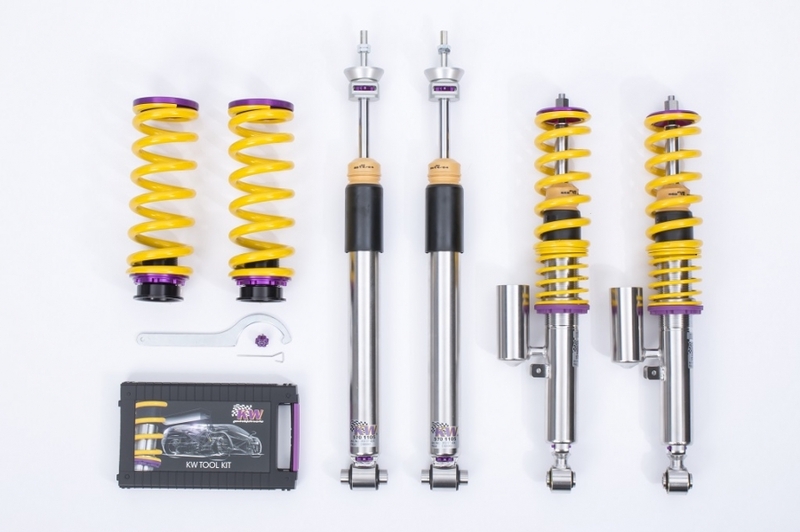 The coilover kit is made of stainless steel and allows for continuous lowering of up to 30 mm. The suspension kit is separately adjustable in compression and rebound damping and is similar to the KW Competition suspension in the Farnbacher Racing Lexus RC F GT3 which is used for the VLN endurance Championship on the Nürburgring Nordschleife. 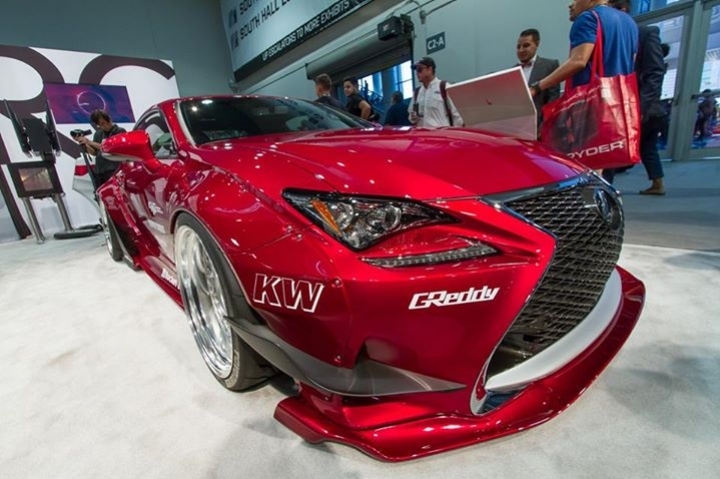 With the adjustable dampers, the KW Variant 3 coilover suspension has numerous setup options especially to accommodate performance modifications such as changes in tire / wheel combinations, a modified braking system or an increase in output at the 477 hp strong Lexus RC F.
Via the rebound adjustment wheel at the upper end of the piston rod, the rebound damping of the KW coilover kit can be changed in 16 exact clicks. With a lower rebound force, the comfort increases, while at an increased rebound force, the handling is further increased and the body vibrations are reduced. So even at a very high speed, the steering precision is noticeably improved. Independently, the KW multi-way valve at the lower end of the damper inner tube allows you to adjust the compression damping; in combination with the suspension spring and takes influence on the immersion speed of the piston rod. Via the integrated click wheel located directly on the stainless steel housing, the damping force can be adjusted in twelve clicks, so that no rolling motion occurs. In addition, a higher compression level at the front axle supports an even more direct steering and at the rear axle it counteracts an oversteering. Due to the valve assembly of the compression damping, the deflection behavior during fast driving over speed bumps is not affected. Since the patented compression adjustment is at the lower piston end of the stainless steel housing, no tools are required.